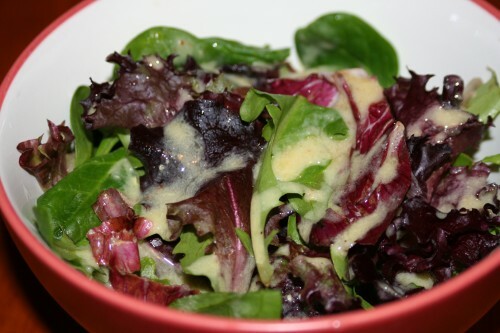 I wish I could say that I make all of my salad dressings at home, because truly they are so easy! However, I admittedly keep a bottle or two of the store bought kind in the door of my fridge for the days I don't feel like whipping up my own batch. If you've never made your own salad dressing, though, I suggest you try it sometime. I found this dressing recipe in Mariel's Kitchen and have made it many times. The original recipe didn't include any particular seasonings, so I always jazz it up with salt, pepper and anything else from my spice cabinet that suits my palate and salad bowl. Enjoy creating your own version. Blend until creamy. Store any leftovers in the fridge. I thought the vinegar was a good touch and bumped the flavor up a few notches from many standard mustard dressings.